Southern Illinois University Press, 9780809328765, 224pp. Unfriendly Witnesses: Gender, Theater, and Film in the McCarthy Era examines the experiences of seven prominent women of stage and screen whose lives and careers were damaged by the McCarthy-era “witch hunts” for Communists and Communist sympathizers in the entertainment industry: Judy Holliday, Anne Revere, Lillian Hellman, Dorothy Parker, Margaret Webster, Mady Christians, and Kim Hunter. The effects on women of the anti-Communist crusades that swept the nation between 1947 and 1962 have been largely overlooked by cultural critics and historians, who have instead focused their attention on the men of the period. Author Milly S. Barranger looks at the gender issues inherent in the investigations and at the destructive impact the investigations had on the lives and careers of these seven women—and on American film and theater and culture in general. Issues of gender and politics surface in the women’s testimony before the committeemen, labeled “unfriendly” because the women refused to name names. 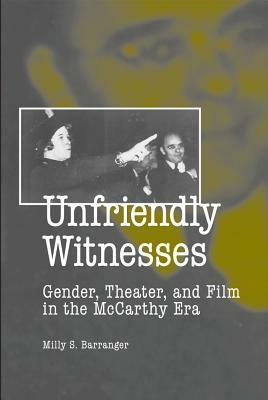 Unfriendly Witnesses redresses the absence of women’s histories during this era of modern political history and identifies the enduring strains of McCarthyism in postmillennial America. Barranger recreates the congressional and state hearings that addressed the alleged Communist influence in the entertainment industry and examines in detail the cases of these seven women, including the appearance of actress Judy Holliday before the committee of Senator Pat McCarran, who aimed to limit the immigration of Eastern Europeans; actress Anne Revere and playwright Lillian Hellman, appearing before the House Un-American Activities Committee, sought the protections of the Fifth Amendment with different outcomes; of writer Dorothy Parker, who testified before a New York state legislative committee investigating contributions to “front” groups; and of director Margaret Webster, before Senator Joseph McCarthy’s subcommittee, whose aim was the indictment of Senator J. William Fulbright and the U.S. State Department. None escaped subsequent blacklisting, denial of employment, and notations in FBI files that they were threats to national security. Unfriendly Witnesses is enhanced by nine illustrations and extensive excerpts from Red Channels: The Report of Communist Influence in Radio and Television, originally published in 1950 at the height of the Red Scare, and which listed 151 allegedly subversive writers, directors, and performers. Barranger includes the complete entries from Red Channels for the seven women she discusses, which include the “subversive” affiliations that prompted the women’s interrogation by the government. Milly Barranger is a distinguished professor emerita of theater history and theory and a former producing director of the PlayMakers Repertory Company. She is the author of Margaret Webster: A Life in the Theater; Theatre, a Way of Seeing; and Understanding Plays, Third Edition. The Hollywood Blacklist, which was in effect from the mid-1940s to the early 1960s, has been well documented in books like Time of the Toad, The Inquisition in Hollywood, and Fear on Trial. It has been the subject of documentaries like Scandalize My Name: Stories from the Blacklist (1998) and Legacy of the Hollywood Blacklist (1987). Also the stories of the Hollywood Ten, actors, playwrights, and directors like Lee J. Cobb, James Garfield, Edward G. Robinson, Eli Kazan, Arthur Miller, and Clifford Odets and their experiences with HUAC have been well documented. What has not been well documented is how the Blacklist affected some women who had a connection to movies, television, and the theatre. With Unfriendly Witnesses, Milly S. Barranger has attempted to rectify this oversight. In this book, which is part of the Southern Illinois University Press Series Theatre in the Americas, Barranger, a professor of Dramatic Art at the University of North Carolina, presents case studies of seven prominent women, and places them within the larger context of the “Red Scare.” These women are Judy Holliday, Anne Revere, Lillian Hellman, Dorothy Parker, Margaret Webster, Mady Christians, and Kim Hunter. The movie and television industry used publications like Red Channels, Counterattack, and Aware to gauge who was un-American or a Communist and therefore unemployable. The names of the above seven women appeared in these publications as possible Communists. Judy Holiday, who starred on Broadway and went on to star in such noteworthy films as Adam’s Rib (1949), had “nine offenses” in Red Channels. She was called before HUAC to testify, and was subsequently dropped by CBS and ABC, even though she was not a Communist and had no real party ties. She played her role before the committee as she would any acting job, and showed that a strong woman could get through it. Her career was not appreciably affected; she continued to act on television, and became one the performers to prevail over the Blacklist. However, Mady Christians (I Remember Mama, 1948) was not so lucky. There is speculation that the stress caused just by being investigated as a Communist contributed to her cerebral hemorrhage before she even had a chance to testify before the committee. Anne Revere (A Place in the Sun, 1951) was being watched as early as 1943, and her performance as an “unfriendly witness” before HUAC makes her story one of the more colorful ones. She continued to work in theatre, acting in Arthur Miller’s parable of the times, The Crucible. Interestingly, by the time it ended its investigation, the FBI almost seemed to be afraid of her. When Revere won a Tony for her performance in the play Toys in the Attic, the FBI stopped its surveillance. The most interesting chapter covers the writers Lillian Hellman (Children’s Hour) and Dorothy Parker (A Star is Born/Nothing’s Sacred). Parker was a diehard activist who worked to help the poor and disenfranchised. Hellman, on the other hand, was involved with the noted Marxist writer Dashiell Hammett (The Maltese Falcon). She even admitted that at one time she had flirted with Communism. Parker ended up an alcoholic, and never really recovered from the shock of being investigated. However, Hellman continued to fight for the causes in which she believed, wrote her memoires (An Unfinished Woman), and was an iconoclast till her death in 1984. Margaret Webster was a stage director and daughter of actress Dame May Whittey. She is noteworthy for being the first to employ an African-American actor in the title role of Othello, on Broadway (1944). She was deemed guilty by being associated with folks like Paul Robeson, Jose Ferrer, and Uta Hagan. Her innocent choices during and before the war years came back to haunt her. Kim Hunter (The Seventh Victim, 1943) was known for her film and Broadway role of Stella Kowalski in Tennessee Williams’s A Streetcar Named Desire. At the hearings, she claimed that she had nothing but disdain for Communism. However, during her early career she had associated with groups like Americans for Democratic Action, and had signed petitions for the World Peace Conference. Of all those profiled by Barranger, Kim Hunter seems to be the one who came out most unscathed. Although she did not have any offers for work in 1954, in 1955 and 1956 she was back appearing on network television, and her career lasted for 43 years. It is well known that those who worked solely in theater/Broadway were not subjected to the same kind of scrutiny that hindered employment in movies and television. However, Barranger points out that there was a kind of “Graylist” which seemed to make it difficult, but not impossible, for some to get good paying jobs in New York theater and other places. The author presents these women, with the exception of Mady Christians, as “survivors.” They were up against terrible odds and lived through their trials. The author ends this study with a warning that similar situations could happen in our post 9/11 society. She cites the Patriot Act and possible government surveillance of those deemed unpatriotic as potential dangers. She equates the condemnation of the Dixie Chicks’ “anti-American” remarks by some radio stations to blacklisting, and compares the few CD burnings by conservative organizations to a modern-day book-burning. Unfriendly Witnesses documents a formerly untold story that needs to be told and read. It is well written and well documented, and it could be used in American History, Women’s Studies, Theater History, or Film History courses. This book is written in a way that allows students, academics, and the general public to find something of interest. By quoting from actual testimonies, it also provides a unique insight into these brave women. In the appendices Barranger has a timeline for women on the left, 1919-1976, which helps the historical context. Excerpts from Red Channels: The Report of Communist Influence in Radio and Television 1950 is also provided for context. Barranger’s bibliography is extensive. This book is recommended for both public and academic libraries. The bulk of Unfriendly Witnesses is devoted to the seven celebrities whom the press called "McCarthy's Women" — Judy Holliday, Mady Christians,Anne Revere, Kim Hunter, Margaret Webster, Lillian Hellman, and Dorothy Parker. Barranger gives an in-depth history of each woman, noting family history and early career successes. This provides the reader with the contrastof each woman's life after being blacklisted and brings a tragic element to the facts as they are presented. In each woman's case a chorus seems to ring through Berranger's writing: "She did not provide names" (p. 47). Their friends and colleagues became informants, yet these women refused. Many were barred from Hollywood and their careers crum­bled. Some found solace in New York working on the stage for significantly less pay. All of these seven women, save one, are por­trayed as survivors. That one, Mady Christians, was perhaps the most tragic: as her successful career abruptly came to a halt when she was blacklisted, Christians was unable to find work, and her health deteriorated. She became just another performer who, as Victor Navasky is quoted saying, "seemed to die of the blacklist" (p. 48).